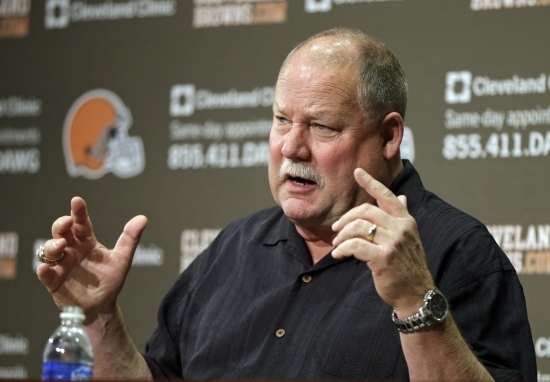 The Mike Holmgren era ended on Tuesday in Cleveland, not with a bang but with a bit of a wimper. Holmgren held his final press conference as team president of the Cleveland Browns and, while he will stay on through the end of the season in a transitional role, his time is definitely up. The Browns didn’t win enough under Holmgren – the team was 10-29 with Holmgren as team president – to satisfy a fan base that is running out of patience after countless rebuilds and restarts. And he couldn’t win with the media, who were cranky that Holmgren would not talk to them whenever they demanded and got their feelings hurt when Holmgren didn’t wind up coaching the Browns – despite Holmgren and everyone associated with the Browns saying a number of times that would not happen. While the final record is not what anyone would have hoped for, only the most obtuse would claim the Browns are not in a better place than they were three years ago. Holmgren rebuilt the football side into an actual NFL structure, with a general manager and a coach who each know their roles (there is now very little chance that coach Pat Shumur locks Tom Heckert in a closet on draft day and makes the picks himself). He made sure that Jim Brown was no longer whispering sweet nothings in Randy Lerner’s ear (and all you have to do is look at the Browns record while Brown was “advising” Lerner to realize how important that was). And there is no question that the roster is better. Now, how much better is certainly open to debate. And while it is great that Heckert and Shumur have clearly defined roles, that doesn’t guarantee success (especially on game days; and definitely on fourth-and-one). But as long as the current roster remains mostly intact, the final chapter on Holmgren has yet to be written. “I think I was asked to and I think we’ve fixed a number of problems in the organization,” Holmgren said. “If we wanted to list some things I could do that and feel good about it. Our won-loss record, which is what football teams exist for, hasn’t been good. Say what you want and I think there have been some unusual circumstances, but it hasn’t been very good. I would hope that if the current team and what we’ve built so far now has some success moving forward, I hope people will feel a little bit better about our time. I think it has been a three-year period fixing things. Unfortunately, some of those close games that were mentioned earlier, if we could have won half a dozen of some of those close games it would be a little painful right now. So that’s a wrap on the Big Show in Cleveland. If he’s right – and Browns fans everywhere better hope he is – that the foundation is in place, then hopefully Joe Banner working full time can can finish the job. If not, we may be doing this again in three years with Banner.